Fiona Triaca, a former arts student turned stockbroker turned creative entrepreneur, helps people within organisations to bring ideas to life and to find more meaning in their work. Through her company Naked Ambition – co-founded with Erica Liston – Fiona helps people build their personal brands and bring more creativity into their workplace. Naked Ambition and DFM have collaborated on skill-sharing projects and supported each other’s efforts as part of the innovation community in Melbourne. 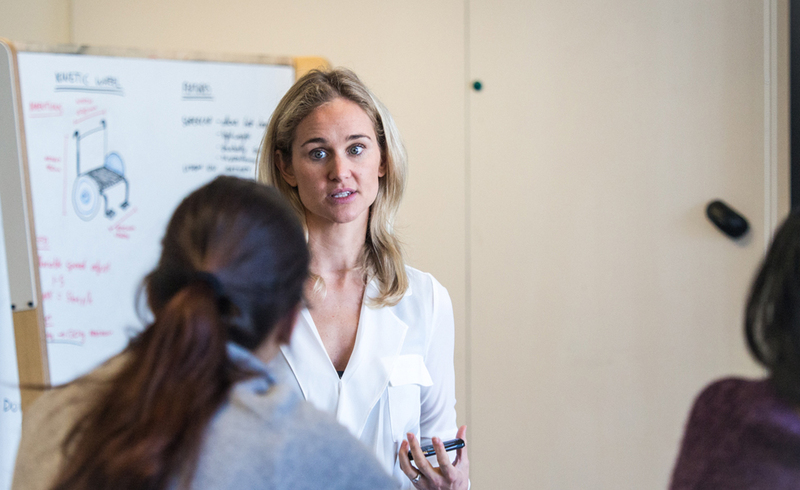 We recently had the pleasure of having Fiona host an insightful and hands-on personal branding workshop for our students. We caught up with Fiona afterwards to discuss personal branding and how they have been incorporating Design Thinking into their work. Fiona sharing her knowledge of storytelling with DFM students. How would you describe personal branding ? It’s about bringing the best of you, to what you do. Rather than ‘selling yourself and pushing out’ it’s about looking for how you can create value for your audience/network. It’s about getting the message out to the world about what you’re capable of (your strengths/experience/passion), so you can create a pull. A pull brand means people are engaging with the content you’re producing and naturally seeing how you’re contributing to the conversation, which gives you a better chance of attracting the opportunities that you want. I’m passionate about building a personal brand at any age – but especially for student groups as they often they have anything to say yet, but they are exactly the people we need to hear more from. How is personal branding done? We take the idea of personal branding and marry that up with a “design thinking mindset.” The designer’s mindset and personal branding go beautifully together. There are parallels between practicing empathy, which is part of a designer’s mindset, and having empathy for the people we are serving with our personal brand. Aside from the typical online presence and social media tools, one of the techniques I think that should be done every single day, is being curious about people and our surroundings. Part of what we teach in our longer courses is actually basically value proposition design. It has to do with understanding more about customers, so you can be more responsive in a way that you can interact. I think empathetic communication is something big as well; that sort of active listening is very important for your brand. If you want to be part of the conversation you’ve got to be sharing ideas in order to get ideas back. People need to know where you are in order to bring new exciting information that is out there. It’s all about ‘like attracts like’. This is another way for people to become better at their craft because then others can find them and they can collaborate. Who typically wants to develop their personal brand? It’s usually a team leader that wants to do this for their team. Lots of companies now are investing in their emerging leaders for their next generation. They’re looking for an alternative to the traditional training that has been available to them. What are the biggest ‘aha’-moments people get while learning about personal branding? One of the key exercises we do in our sessions is the creation of a written personal profile. This is a 200 word story about who you are, where you’ve been and where you are going. This piece is written for you by another participant in the session which offers a unique perspective on your experiences and achievements. People often say “I’ve never really been able to articulate what I’ve done like this, I’ve never appreciated that as something really special”. Having another voice, someone else to speak for you is powerful. It’s about creating leaders within teams and that’s what we want to do. We want to show them that their role matters and that they’re valuable within the organisation. How was it working with University students for a change? So good! I loved this because this is where we started with the company as well. The first ever client we had was UTS in Sydney. I think it’s critical to start working on your brand as early as possible. For students before they start investing in their future careers – we plant a few seeds that will help them building their brand early on. Fiona and DFM students working through storytelling challenges. Remember: If it matters, it flatters: Spending some time articulating what really matters to you, ‘your why’, will help you get clearer on what your personal brand is about and where you want to go in your career. And if the people around you know what you want, they can advocate for you. Your boss, your housemate, your next door neighbour can all be powerful voices for your advancement if they know what you are about and where you want to go. Think: Online + Offline = Front of Mind: Social media presents a huge opportunity to shape your brand and build your career. Get your LinkedIn profile sorted. Today. And make sure it has a great photo. Profiles with photos are 11x more likely to be viewed. Which means you can attract more sales / more offers / more opportunities – whatever your career soul seeks.